No one is quite sure who said it first, but longtime fishing guide Capt. Scotty Moore said it again Aug. 31. East and northeast breezes, afternoon thunderstorms pushing northwest and slightly cooler temperatures contributed to a reduction in red tide’s impact, especially on the beaches. Islanders were happy to find fewer dead fish and other sea life on the shore. Manatee County reported a total of 241 tons of dead sea life removed from the beaches as of Aug. 26. 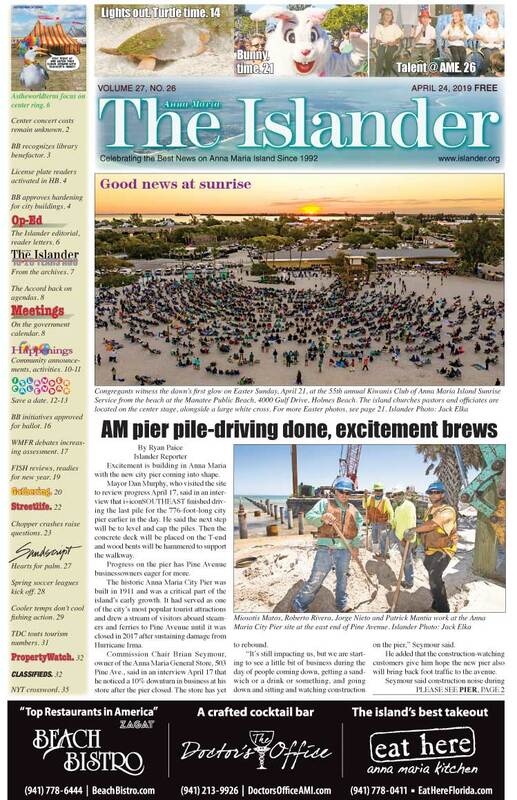 The county announced Aug. 27 a private contractor hired to remove debris from hard-to-reach areas — such as neighborhood canals and mangrove shorelines — had completed its stint. “This is not a sprint, it’s a marathon,” Charlie Hunsicker, director of the Manatee County Parks and Natural Resources Department said. He encouraged volunteers to continue to participate in area cleanups. 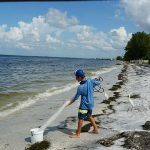 On Aug. 31, the county reported moderate seaweed and dead fish at Bradenton Beach’s Coquina North and Coquina South boat ramps, as well as Coquina Bayside and at Anna Maria’s Bayfront Park. 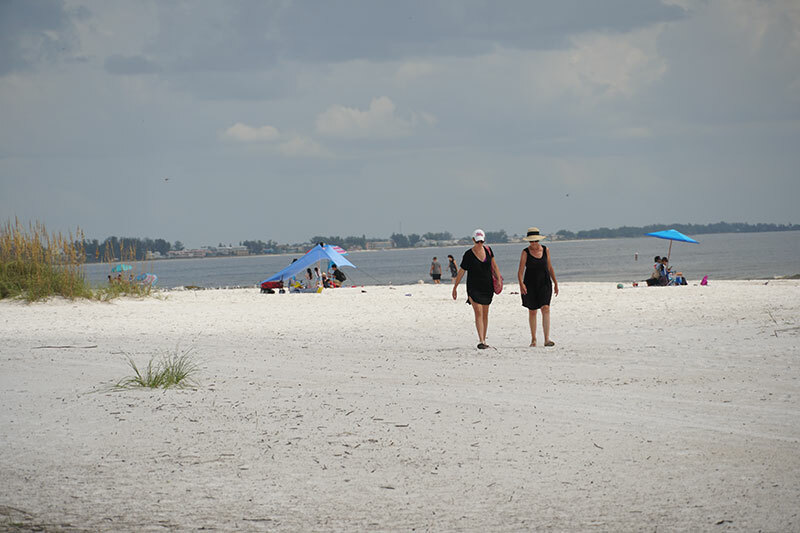 The main beaches from Coquina Beach to Bean Point were clear that day. Locals attempted a rebound to normal life, running specials at eateries to lure in locals and reaching out a helping hand to those affected by red tide. The Roser Food Pantry in Anna Maria announced a program to assist workers struggling through the slowdown. The pantry, 511 Pine Ave., made nonperishable food items and paper goods available to employees and staff of Anna Maria Island and Cortez businesses adversely affected by red tide. The offer of assistance includes a bag of groceries per person per week. Applicants are asked to call the office of Roser Memorial Community Church at 941-778-0414. The Aug. 27-31 Florida Fish and Wildlife Conservation Commission report showed remaining high concentrations of red tide along the coast of Manatee County, with indications of a slight northward movement. In Sarasota County, red tide counts showed a 5-25 percent decrease in concentration. The FWC report said Karenia brevis persisted along a 145-mile stretch of the Southwest Florida coastline where coastal currents were moving the bloom. Meanwhile, in a case of be careful what you wish for, the tropics showed some activity in the Caribbean. Popular among island topics: A tropical storm or hurricane could blow away the red tide or break it up. But not so fast, said Robert Weisberg, a scientist with the University of South Florida. For the past 25 years, Weisberg has predicted red tide blooms by tracking ocean currents. He reported Aug. 29 a significant amount of red tide remained in the nearby offshore waters. “I think it’s going to get worse before it gets better,” Weisberg said. His projections have been correct 20 of the past 25 years. And, he said a tropical storm could disrupt the red tide for a few days, but it wouldn’t make a major difference in duration. Case in point? In 2005, one of the worst red tides in area history occurred. It struck from the Florida Keys in the south to the northern Panhandle. That bloom created a dead zone almost 2,000-square miles from Sarasota to New Port Richey, killing everything from bait fish to dolphins, much like the current bloom. The most active Atlantic hurricane season on record also was in 2005 and not even Hurricane Katrina roaring through the Gulf of Mexico dispersed the red tide. The FWC issued an executive order Aug. 30, making snook and redfish catch-and-release only from the northern tip of Anna Maria Island to Gordon Pass in Collier County. Snook season had been set to open Sept. 1. Meanwhile, the local wildlife rescue Save our Seabirds in Sarasota experienced a surge in bird-related illnesses during week four of the red tide outbreak, while avian sickness on the island seemed to subside. Ed Straight of Wildlife Inc., a home-based rescue in Bradenton Beach, reported receiving one sick laughing gull and a cormorant, both arriving Aug. 30. No new sea turtle deaths or carcasses were reported on the island the final week of August. 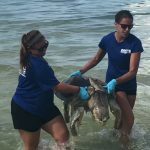 “Maybe we’re getting a reprieve,” Suzi Fox, executive director of the Anna Maria Island Turtle Watch and Shorebird Monitoring, said. Moore said he hopes so. He also hopes people understand the situation. “The fish in the restaurants are safe to eat. They are caught way out in the Gulf, away from the red tide. All the fish out here are not dead. We’ve had some phenomenally high counts of red tide this bloom. But from the Manatee River to the Skyway, there are tons of fish,” Moore said. Moore said fresh water pouring into Sarasota Bay from Lake Manatee kept conditions better to the north of Anna Maria Island — red tide lives in salt water. “I’ve been seeing live fish in the canals at Holmes Beach and in Key Royale,” Moore said. He also said help for business owners may be insufficient.